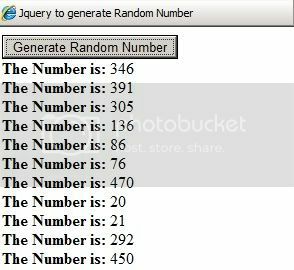 In many forums i found a question "How to generate a Random Number using Jquery?". Its easy to generate a Random number because Jquery provides us builtin Math library function Math.random() to generate the number. To get the output you have to put a number range. Then the the mehod Math.random() will give you a Random Number. You can also use this technique for dice, random image script, or random link generator. Now run the example and hope you can generate random number using JQuery.